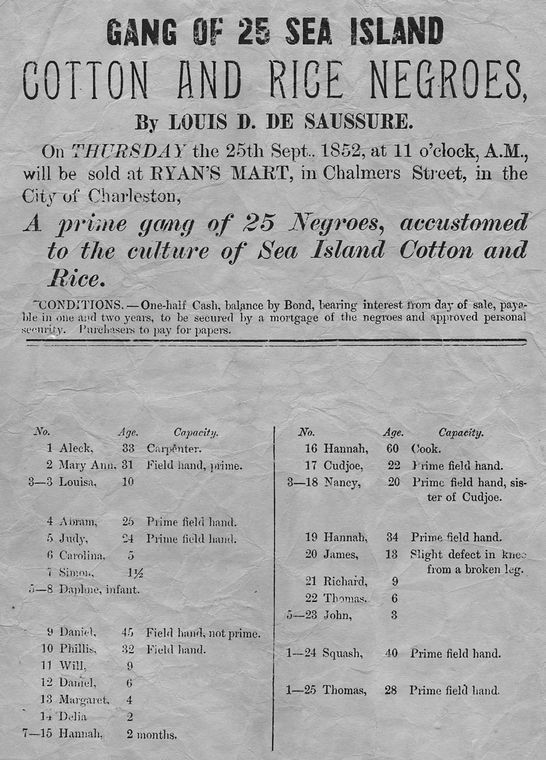 "Gang of 25 Sea Island Cotton and Rice Negroes," slave sale advertisement, Charleston, South Carolina, 1852, courtesy of Duke University Libraries Digital Collections. Despite the legal end of the trans-Atlantic slave trade in the United States in 1808, the domestic slave trade and the illegal trans-Atlantic slave trade continued to thrive in South Carolina until the U.S. Civil War. 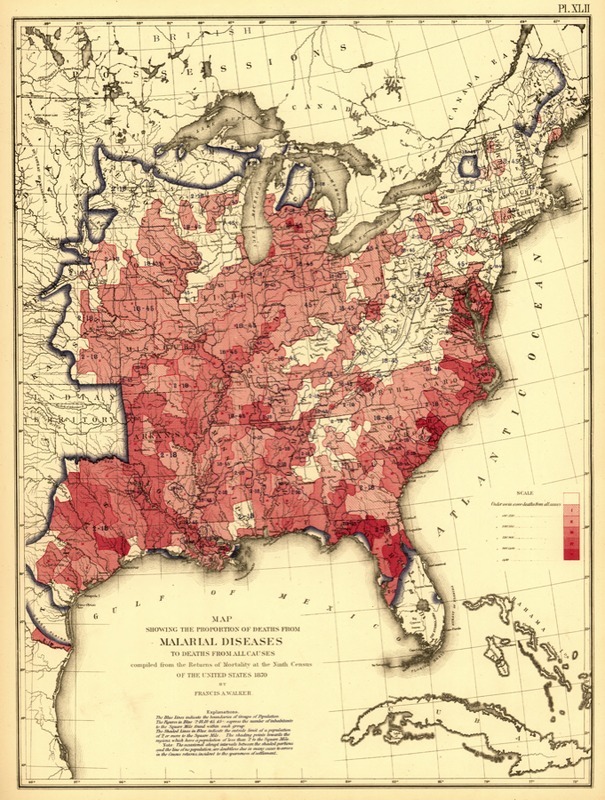 United States map showing the proportion of deaths from malarial diseases, by Francis A. Walker, 1870, courtesy of the Library of Congress. In the reddest areas at least 14% of deaths were attributed to malarial diseases. Despite the commercial success of rice, by the end of the eighteenth century many seasoned planters associated inland rice cultivation with disease, declining soil fertility, pests, and unpredictable water supply. More optimistic planters continued to view lush wetland environments as fertile rice grounds with bountiful opportunity. Dr. George Milligen wrote in the early 1760s that wetlands were the “Golden Mines of Carolina.” The rich “cypress, river, and cane swamps [were the] source of infinite Wealth, and will always reward the industrious and persevering planter.” Enslaved African Americans bore the brunt of these planter ambitions for rice cultivation, and were forced to endure noxious diseases and high mortality rates in rice fields. In contrast to other North American colonies, mortality rates in South Carolina’s enslaved population exceeded birth rates due to the harsh conditions of rice cultivation. To maintain their labor force, Carolina planters continued to acquire large numbers of enslaved Africans through the trans-Atlantic slave trade throughout the eighteenth and early nineteenth century, until the trade legally ended in the United States in 1808. Even after the legal trade ended, many Lowcountry planters continued to buy enslaved Africans through an illegal “black market” trans-Atlantic slave trade that continued up until shortly before the start of the U.S. Civil War in 1861. Disease conditions were harsh due to the sub-tropical climate of the Lowcountry and the built environment of inland rice plantations. Impounded reservoirs and rice fields created optimum environments for malaria-carrying Anopheles mosquitoes. As colonists developed inland rice fields and settled more land in the Carolina frontier, the malaria vector migrated with them. Beginning in the spring, when mosquitoes hatched in water-drenched fields and multiplied throughout the summer, malaria spread from host to host, transferred by the mosquito, bringing epidemic fevers, aches and chills to the rural residents, with potential for chronic relapses. Europeans were especially susceptible to malaria, but enslaved Africans also struggled with the disease, despite some immune system benefits from an inherited sickle cell trait. In addition to unhealthy landscapes, declining soil fertility diminished the role of inland rice culture in the South Carolina market economy. With the constant efforts of inland planters to manipulate soil and water for higher agricultural yields, a series of problems in cultivation became apparent. Both the market’s increasing demand for Carolina rice by the 1760s and correlating intensive agricultural practices led to inland soil exhaustion. Rice extracts nitrogen from the soil, and planters saw diminishing returns if the land was not fertilized. Carolina Gold Rice, image by Kay Rentschler, ca. early 2000s, courtesy of the Carolina Gold Rice Foundation. African Americans "toating [sic] rice on dock," Charleston, South Carolina, ca. 1879, courtesy of Library of Congress Prints and Photographs Division. 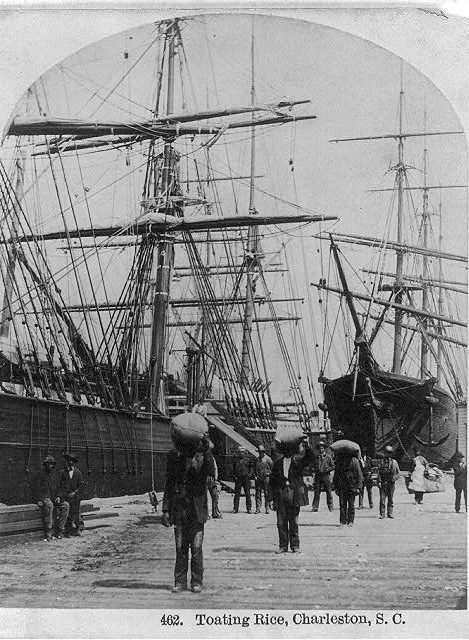 Even after the end of slavery in the United States, African Americans continued to work in rice agriculture and shipping in the South Carolina Lowcountry. Unlike tidal rice fields that enjoyed natural fertilization from river silt, inland-irrigated fields received limited amounts of natural sediments. This difference occurred because reservoirs trapped downward flowing alluvium and suspended organic material, depleting nutrients in the water released into the fields. 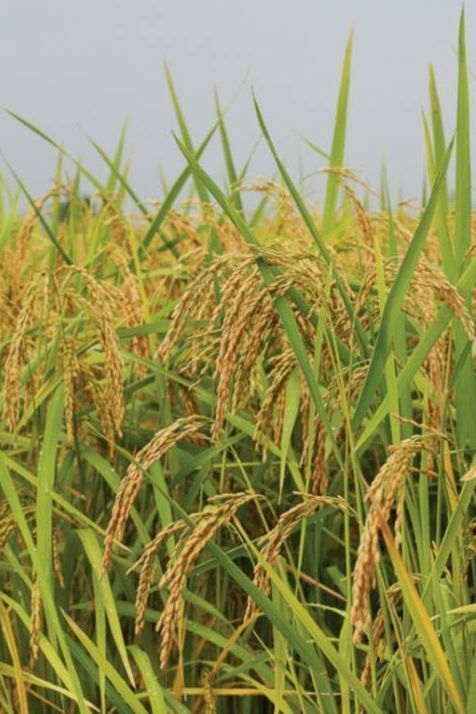 As early as five years after consecutive planting, rice planters noticed decreases in their fields and sought other options, such as clearing new inland wetlands or transferring labor to the emerging tidal floodplains. Finally, the rise of tidal cultivation and the Carolina Gold variety of rice by the late eighteenth century swayed many inland planters to abandon the older agricultural practice for the more modern tidal system. Tidal rice planters reaped more wealth compared to their inland predecessors, because they could flood rice fields with more consistency. They also began to cultivate a new variety of high quality rice, called “Carolina Gold” (because of the gold sheath, not the grain). This variety appeared on the market in the late eighteenth century, just as tidal cultivation was attracting more Lowcountry planters. Carolina Gold generated high yields and a hull that could be easily milled, which made it more efficient to process and market compared to the earlier variety of white grain grown on inland plantations. Rice output exploded with the rise of tidal cultivation. In 1800, 28,500 tons of rice were exported from rice producing states, principally South Carolina and Georgia. By 1815, 41,350 tons were exported, and in 1828 exports rose to 51,500 tons. Eventually, the national exports of rice peaked in 1835, with 64,000 tons. Carolina Gold’s higher grain quality resulted in a greater demand for the crop from merchant factors. This led to a higher price on the international exchange market for rice after the American Revolution. South Carolina rice production first surged in the 1760s, but Carolina Gold made rice a central commodity on the Atlantic World market in the early nineteenth century. Despite the increase in tidal rice cultivation, planters continued to grow inland rice in select locations until the U.S. Civil War. For example, the two most successful rice operations in Christ Church Parish in 1850, east of the Cooper River, were inland rice plantations. Successful planters tended to consolidate tracts of land so that they could increase their rice field acreage. Located in broad low-lying floodplains, these large inland rice plantations mimicked the expansive tidal rice infrastructure, represented by miles of embankments and canals. Plantations located at the headwaters of the Wando River and in the Rantowles Basin (west of the Ashley River) were two areas noted for large-scale inland rice cultivation. 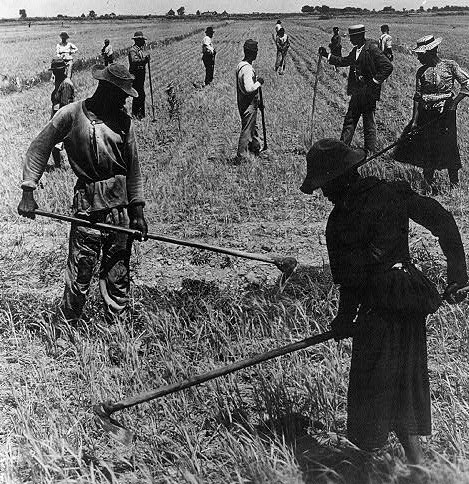 African American workers hoeing rice, South Carolina, ca. 1904, courtesy of Library of Congress Prints and Photographs Division. The rise of tidal rice fields combined with the development of the Carolina Golden Rice led to a decline in inland rice farming, although it would continue until the US Civil War.